If you're thinking about making homemade edible holiday gifts this year, I definitely recommend that you mix up a few batches of my Gingerbread Buttermilk Pancake Mix. This gently spiced pancake batter is easy and inexpensive to make, but the results are incredible and much better than anything you can ever buy in a box. Package this one up in pretty glass jars or sturdy paper bags and include them as part of a holiday breakfast gift basket. 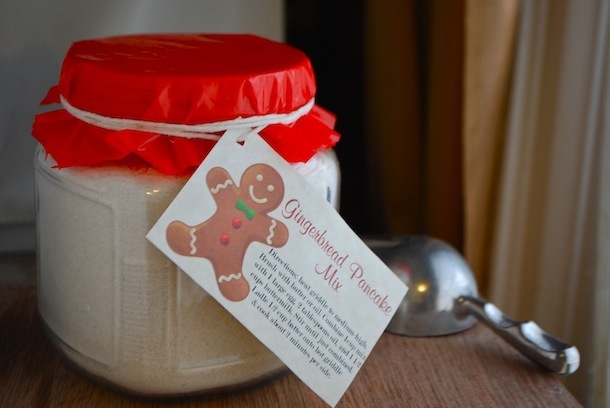 This is also a great mix to keep around when entertaining holiday guests--gingerbread pancakes on Christmas morning? Yes, please! **Note: My recipe & photo were originally published on the Fox News website last year, but is no longer available there so I'm reposting here. Makes one roughly 4 ½ cup batch of pancake mix, enough for about 30 pancakes. Can be multiplied as necessary.